One of my pet peeves about bicycle programs for impoverished peopled is the tendency for these programs to ship abandoned bikes away to countries perceived to be “poor.” Usually Africa is the recipient. Not only do the messages of these programs offend Africans and people in other developing countries, for goodness sake, they’re shipping great bikes away from people who could use them in their own countries! This is one important reason why One Street is so focused on our Social Bike Business program – to keep bikes and bike careers in their communities. I’ve had some rather bizarre discussions about this with bike advocates and program leaders in various countries who support these overseas shipment programs and have found to my amazement a common denial that their country has any impoverished or struggling people. When I’ve pushed this point, sometimes they will admit there are some, but then continue to argue for shipping their bikes away. These discussions uncover a disturbing blindness when it comes to recognizing poverty in our own communities. Here is one article about some people trying to reveal the invisibility of homelessness. I realize that some of these bikes do fill important, temporary gaps in some countries. But in general they are preventing better long-term solutions such as local bike manufacturing and businesses that could supply affordable bikes and at the same time create bike careers for local people. Thus, they remove an opportunity from one community and hamper opportunities in the receiving community. So I was very happy to find this article from Wichita, Kansas, of all places. Their program to match abandoned bikes with currently homeless people in their city seems like a great model. I plan to point to this example the next time I engage in a heated discussion about shipping bikes away from people who could use them, right where they already are. 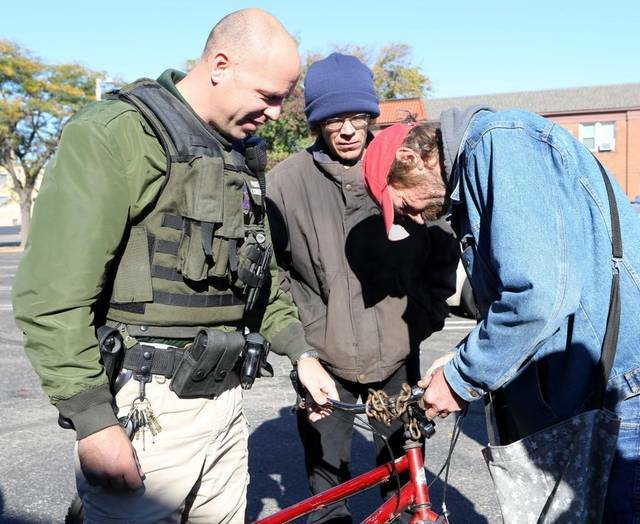 Do you know of other nice examples that are keeping abandoned bikes in their communities? Please offer them in the comments section.